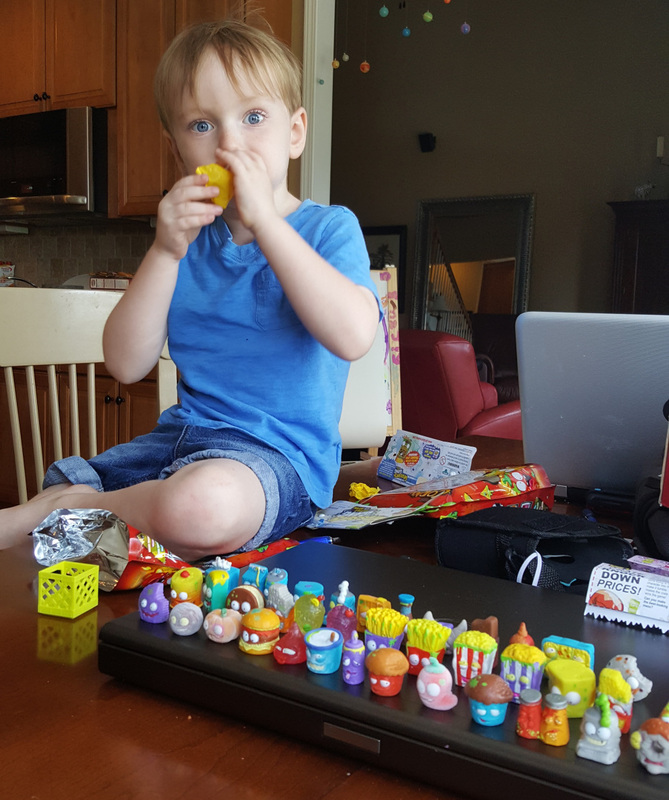 For 5-year-old Jett Black, few things are as cool as the Grossery Gang, a collection of tiny rubber toys with colorful names like Awful Waffle and Sticky Soda. “I collect them! Just because they’re neat,” says Jett, who has more than 100 of these character. In all, there are some 200 characters, says Jett’s dad, Ken Black. The characters come in several colors and are sold in packs, which means you might end up with multiples of one character and none of another. As a result, growing a Grossery Gang collection can take some time and effort. And early on, Jett embraced a data-driven approach. “There’s a little tablet app that you can get from Moose Toys, the makers of the Grossery Gang. And you can check whether you want the character or have the character,” says Ken. With the app, Jett knew exactly which characters he had in which colors at any given time. So when he’d pick out his pack of Grossery Gang, which is only sold in multiples, he could pick the ones that would give him the most new characters. But soon, Jett had a question the app couldn’t answer: “He wanted to know which ones he had duplicates and triplicates of so he could trade them," says Ken. 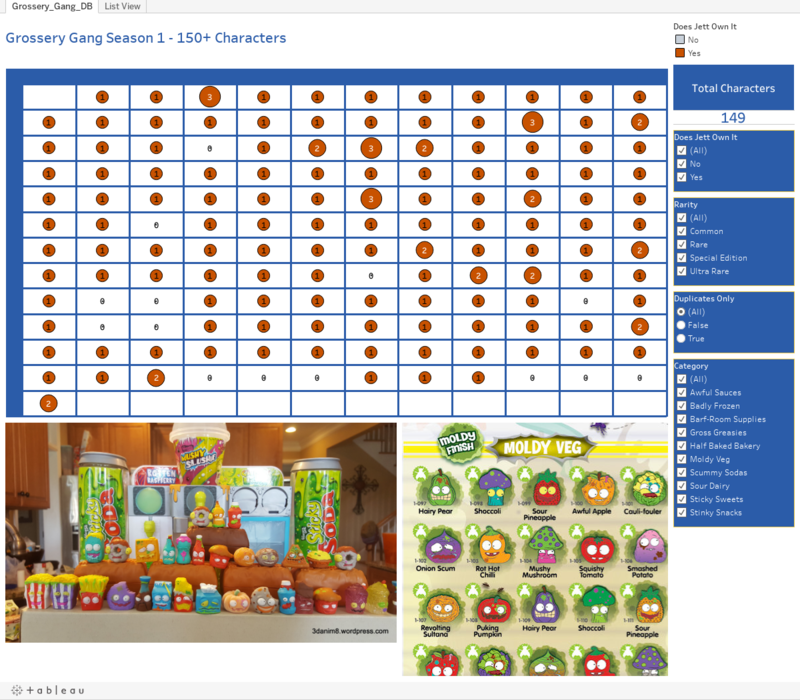 To find out, Jett and Ken built what they now call “the database”—an Excel sheet that lists every Grossery Gang character by name, color, and rarity. The data also notes whether Jett owns the character, and if so, how many. Ken then visualized the data using Tableau. The numbers on the matrix show how many multiples Jett has in his collection. Then clicking on a number shows additional details like character name and photo. Ken, a Tableau enthusiast himself, had been trying to get Jett to try Tableau for some time. But Jett didn’t show any real interest until Ken found data that proved interesting to Jett. “I’d show him a few things periodically, but it wasn’t clicking until the Grossery Gang characters came alive on the dashboard,” says Ken. So Dad took the opportunity to start teaching Jett about the basics of data, like rows and columns. And Jett’s already learning about additional levels of detail in the data. “In the beginning, he didn’t understand the rarity designation of each piece. Then, all of a sudden, he could tell me what each character was—common, rare, special-edition, or ultra-rare,” Ken says. Jett clearly understands the connection between the data and the dashboard, says Ken. “I don’t know how much we can expect from someone who just turned 5, but he’s getting it,” Ken says. Ken has plans to enhance the dashboard with images of Jett’s own paintings as well as YouTube videos of the Grossery Gang, which Jett likes. He sees that Jett is thinking in data, and he plans to feed that shared interest. To learn more about Ken and Jett's data-viz adventures, check out the pair's YouTube videos as well as Ken's blog, 3danim8.